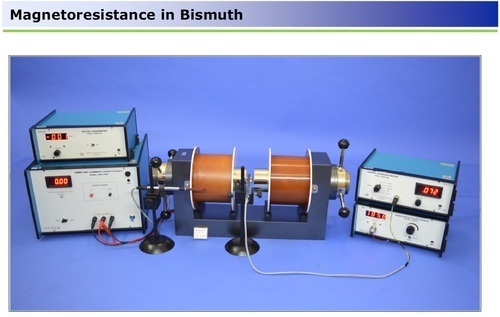 It is noticed that the resistance of the sample changes when the magnetic field is turned on. The phenomenon, called magnetoresistance, is due to the fact that the drift velocity of all the carriers is not same. With the magnetic field on; the Hall voltage V = Eyt =|v × H| compensates exactly the Lorentz force for carriers with the average velocity; slower carriers will be over compensated and faster one undercompensated, resulting in trajectories that are not along the applied field. This results in an effective decrease of the mean free path and hence an increase in resistivity. We, “Safire Scientific Company” from 1979 are actively engaged in manufacturing, supplying, exporting and trading a broad array of high-quality Scientific Lab Equipment. In our offered range, we have Imported Laboratory Instruments, Imported Weighing Balances, and Autoclave. These offered assortments are made by taking high-grade components as per the well-defined industry norms. Our offered ranges of products are broadly demanded by the clients for their unique attributes like high durability, easy to use and supreme quality. Also, we are offering this assortment as per the client specific requirements at the nominal market price range. These offered ranges are used in leading educational institutions, Biotech & Industrial Laboratories, Testing Units of Goldsmiths and Research Scholars. We are backed with the state-of-the-art infrastructural set up for manufacturing our offered range of products. Moreover, we are backed by a team of hard-working professionals, who always put their effort towards the favor of our organization. Our team of quality experts ensures that every product is manufactured from superior quality raw material to as per the industry quality standards. As a client centric firm, we always try to satisfy our customers by delivering them their preferred products timely. Apart from this, these attributes have allowed us to build vast customer base all across the nation. Some of them are Tamil Nadu Agricultural University (TNAU), Annamalai University and Bharathiar University. Also, we offer these products under the Loba Chemie, Sigma-Alorich, Supelco, Merck, Fluka, Rankem, Alfa Aesar, Acros Organics, Himedia, Nice, Spectrum, Fisher Chemical, Fisher Scientific, Hanna, Labomed and Olympus Brand names in the market. We export our products all over the world.